When the food alone isn’t creating the drama or intrigue you want in your food photography, using decorative accents — of color, shape, or texture — can give your images the extra impact you’re looking for. Accents are enhancements to the food subject, and, although they serve the purpose of perking up the food, they’re certainly not the main focus of the image. The key to using accents well is knowing what accents to use, how to use them, and where to place them. You also want to make sure that they don’t steal the show from the main food subject. When placing decorative accents on a food, variety is key. You don’t need a variety of types of accents — one type will do nicely — but you do want a variety of angles and sizes of the accent you place on the dish. You can also bump up the color factor by using garnishes in a contrasting color to enhance the main color of the food. Get creative with non-food accents. Sometimes an image calls out for an accent that’s related to the food but isn’t food. These accents can be as simple as a curling ribbon or a few small birthday candles next to a birthday cake. Keep it fresh. When using fresh greens for accents, make sure to keep the greens chilled to increase the overall look of freshness within the image. Use curls for fun. A few nicely placed curls of chocolate atop or alongside a chocolate mousse can really knock an image out of the park. The same goes for adding curls of Parmesan cheese sprinkled on an Italian dish. Use different accent colors. Try using accents that are a good, colorful contrast to your main subject, such as green dill with red tomatoes (see the following figure). Vary the angles. Make sure each accent has its own unique angle. When you place accents at the same angle, they can make a photo look unnatural and staged. Also, don’t place accents directly horizontal or vertical. Always keep your accents slightly askew. Vary the size. Varying the size of your accents is always a good idea because you want to avoid the look of sameness. Each accent should have its own unique look. 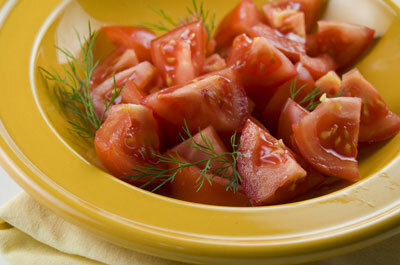 Fresh green accents add a nice contrast to cut red tomatoes. Don’t forget about accents when photographing beverages. You can choose from many creative accents for drinks, such as citrus peels, star anise, mint sprigs, plastic straws, and beyond. These accents can take an ordinary drink image and elevate it to high art. When using accents for drinks, going a bit larger with size is okay. Drink accents are generally a greater part of the image than accents you use with food, as you can see in the following figure. A plain drink can photograph as too simple or too plain, and it may need to be dressed up for a successful shot. 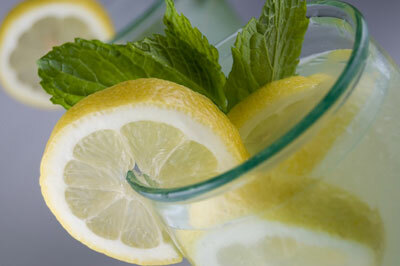 Citrus wedges and fresh mint sprigs adorn this beverage. Although you can use tablecloths or placemats for a food image, cloth napkins are small and easily adjustable. In addition to the food subject, they can set the artistic tone of an image. The linens you choose can make a shot look homey and comfortable, powerfully graphic, or upscale and elegant. You can open up cloth napkins and use them as a background, or you can use them in a more traditional way as a prop for a food shot. When using a napkin as a prop, the goal is to make the napkin look naturally placed. You can have a napkin under the main dish or set out in a formal place setting. It can be unfolded, folded with one fold, slightly rumpled, and so on. You can even use napkins stacked up as part of a cool background for a shot, as in the following figure. For the most part, the napkin prop should be a hint, not the main focus of the image. Depending on the subject, too much napkin showing can detract from the shot. 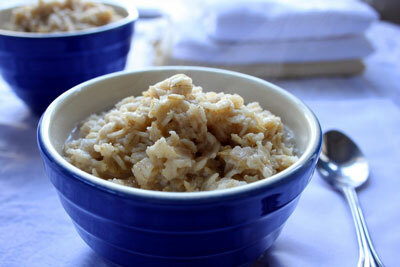 Stacked napkins in the background give this shot of steaming oatmeal a homey feel. Notice the simple bunching of the yellow cotton napkin in the following figure. 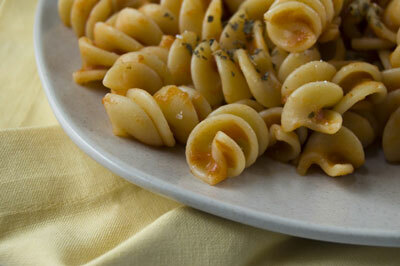 A couple of gentle folds create lines that lead your eye to the pasta. The yellow in the napkin also complements the warm tones in the pasta. A folded napkin creates warmth under a pasta dish.